Is there any paperwork or document for the mechanical systems of N/A Leslie St, Aurora, Ontario? I need more information about the property at N/A Leslie St, Aurora, Ontario. How ist the neighborhood, location and nearby amenities for N/A Leslie St, Aurora, Ontario? I have questions about the roof, foundation, insulations and mechanical issues of N/A Leslie St, Aurora, Ontario? I need more information about property details. What's wrong with this house? Is this a short sale? Is there any maintenance for N/A Leslie St, Aurora, Ontario? What is this property worth in today's market? What are "closing costs", and how much? What steps should I take when looking for a home loan? What price home can I afford? Is my credit good enough to buy this house? What are the best mortgage options for me? How flexible is the seller on the asking price? How low can I consider offering for N/A Leslie St, Aurora, Ontario? Retail Lot For Sale Which Permits Dry Cleaning Depot, Financial Institution (With Drive Thru), Office, Medical, Personal Service Shop, Retail Store, Restaurant, Fitness Centre, Day Nursery & Convention Centre To Name A Few. Surrounded By New Residential, Industrial & Office Uses. Can Be Combined With Block 28 For A Total Of 17.2 Acres. (Legal Description To Be Determined Upon Registration Of Subdivision) - Block 27. 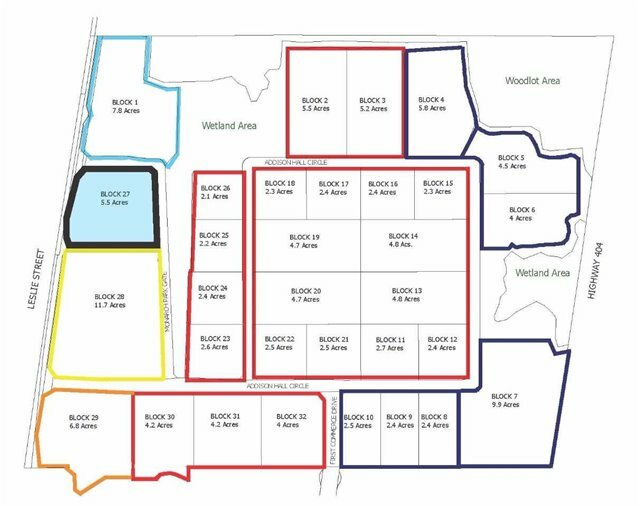 Lots Are Part Of The New Addison Hall Business Park Located Near Hwy 404 & Wellington St. E. Be A Part Of The Growing Aurora Business Community & Join Neighbours Like State Farm, Magna & Bulk Barn. Property Taxes To Be Assessed.